Should You Go See ‘Finding Dory’? It looks like fans of 2003’s “Finding Nemo” have lots of reasons to be happy about its sequel, “Finding Dory,” which comes out in theaters on Friday, June 17. When the trailer for “Finding Dory” was released, there was a brief flurry of interest on the Internet from people who thought they might have glimpsed a lesbian couple. As it turns out, it’s just two women, seen for a brief flash, whose relationship, if any, is left up entirely to the viewer. Objectionable elements are virtually absent. Andrew Stanton and Angus MacLane, the co-directors of “Finding Dory,” have made a beautiful, rambunctious, and fully felt sequel — a movie totally worth its salt water. It’s a film that spills over with laughs (most of them good, a few of them shticky) and tears (all of them earned), supporting characters who are meant to slay us (and mostly do) with their irascible sharp tongues, and dizzyingly extended flights of physical comedy. The images never stop dazzling us with their awesome, tactile sheen ­— their oceanic incandescence. (Who needs 3D glasses? Even if you happen to see “Finding Dory” in 2D, just about every shot in it pops out at you with beauty.) In a summer of tepid and disappointing sequels, audiences from around the world will be grateful to encounter a sequel to a movie as beloved as “Finding Nemo” that more than lives up to the first film’s casually magical charms. And in 2003, Finding Nemo became a $900 million box-office smash by scolding overprotective parents, encouraging kids not to let their folks’ nervous fussing hold them back, and gently suggesting that disabilities aren’t the same as limitations. The sequel, Finding Dory, doubles down on that last idea with an entire story focused on coping with disability and despair, couched in the usual Pixar antic adventure. Finding Nemo’s title character has one undersized fin and isn’t a strong swimmer, but adversity and a similarly fin-impaired role model build his confidence. Similarly, Finding Dory has a character with a debilitating handicap who develops coping mechanisms, gets help where she can, forges ahead when help isn’t available, and succeeds on her own terms. In a way, this is another “Believe in yourself and you can do anything” story. But by refining and focusing that message, writer-director Andrew Stanton and co-director Angus MacLane make it much more relevant. 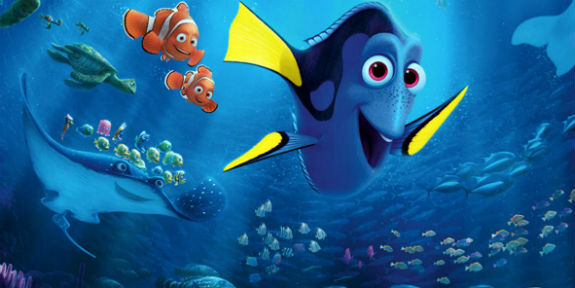 Many kids won’t notice the message: Finding Dory doesn’t explain it in patronizing detail. But it’s likely to hit home for the viewers who most need it, and identify most closely with the story.